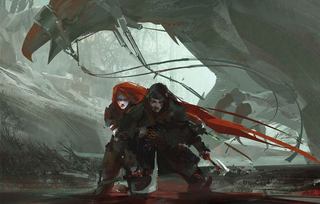 Bringing a fantasy epic to an end is a lot harder than it looks, and as I cracked open the final installment of Brian Staveley’s Chronicles of the Unhewn Throne, The Last Mortal Bond, I wasn’t sure if he would be able to wrap everything up. My worries were unfounded. I’m not typically a fantasy reader: I’m more comfortable with space ships than I am with a door stop fantasy epic that drones on for volume after volume. Staveley’s trilogy, which includes The Emperor’s Blades and The Providence of Fire, worked for me in ways that a lot of other fantasy epics haven’t, and he’s managed to bring the story to a resounding conclusion that makes me want to pick up the entire trilogy and read it again. In The Emperor’s Blades, we’re introduced to the Valyn, Kaden and Adare, the three children of the recently assassinated Annurian Emperor. Valyn is training with the Ketteral, an elite military force that flies covert missions on top of giant birds. Kaden is learning from the Shin monks high in the Bone Mountains, while Adare remains at home in the Dawn Palace, learning the ins and outs of Annurian governance. With the death of their father, they’re plunged into a deep conspiracy that threatens the empire to its core. In The Providence of Fire, battle lines are drawn as Kaden and Valyn flee from forces that wish to undermine the Malkeenian line, and face an even greater threat brewing at the edges of the Empire. At the end, Valyn is left blinded, betrayed by Adare, while Kaden delivers a blow that will likely destroy the Empire from within. The Last Mortal Bond picks up a year after the events of its predecessor, and the world has plunged into some dark times. Kaden has set up an unruly republic in place of the Empire, while Adare and her Csestriim general, Il Tornja work to fend off the Urguhl horde, which threatens to subsume all of Annur. At its head is Balendin, a disgraced Ketteral leach, who draws his power from the terror of those around him. Valyn, blinded, has slipped into darkness, becoming less a man and more a creature bent on vengeance. Where The Emperor’s Blades created a daunting, but somewhat grounded issue of military coup in a fantastic Empire, The Last Mortal Bond shows the long game that Staveley has been playing: the stakes were so much higher than we could have guessed. The entire fate of humanity lies in the power struggle between the remaining, immortal Csestriim and the Gods who created the very fabric of reality. At the beginning of The Emperor’s Blades, and at the beginning of this volume, Staveley takes us far back into the past, showing that the Csestriim began to change - they were emotionless, calculating and sociopathic creatures, while their offspring began to change: they aged, were emotional and in their eyes, were fundamentally broken. This change, brought on by the god of pain and cries, Meshkent, and Ciena, the goddess of pleasure, brought about a war that began thousands of years ago, and which reaches its conclusions by the end of this book. Each of the Malkeenian children are caught in this war, and clash together to save Annur, and all of humanity. This was a challenging book to read, and I ended up going back through the first two books to brush up: like any fantasy epic, the story grows in the telling, and while it’s not quite to the same level of complexity as George R.R. Martin’s Song of Ice and Fire books, there’s plenty going on. The siblings find their own way around the world, but the star of the book is really Gwenna, one of the surviving members of Valyn’s Ketteral Wing, who is dispatched to her former training grounds to recover the surviving Ketteral to use in the war. This is a really good example of where the book really shines: the scenes with the bird-borne soldiers are by far my favorite parts in all three novels, but Gwenna and her compatriots really steal the show. The Eyrie has fallen into civil war with word of Kaden’s Republic and the remains of Adare’s Empire, and she has to fish out the survivors. At the same time, though, this episode is really one of the book’s biggest weaknesses: it feels as though there’s too much crammed in, and it’s distracting from the main thrust of the novel. There’s several episodes like this. One character, thought killed in Providence, returns for a handful of scenes, and is quickly killed off, offering no substantial role for the story - it’s an utter waste. The Ketteral sub-plot feels as though it’s a novella that’s been tacked on to explain how a couple of characters go from point A to B, but it’s again, not something that really impacts the main storyline in any significant way. While I greatly enjoyed both The Providence of Fire and The Last Mortal Bond, I can’t help but feel as though they fall into a classic fantasy trap, getting sidetracked down rabbit holes. Weighing in at over 600 pages, Last Mortal Bonds is a hefty book, but it’s heft that could have been shaved down significantly to deliver a much stronger punch at the end. Don’t get me wrong: this is really a solid conclusion to an already excellent series, but I kept getting kicked out of the world when one of these things came up. What impresses me the most about this book is the sheer scale - Staveley clearly has a mind for history (which makes sense, given that at one point, he taught the subject), and imbues his world with it. The world here is deep and rich, with names and legends tossed out in regular conversation, along with discussions of theology and mythology. Staveley could spend the rest of his career writing novels set in this world and never cover half of it. Fortunately, he’s got several more books coming set in Annur. Moreover, Staveley’s world isn’t one stuck in the past: it’s imbued with a thoroughly modern mindset, which is a nice change of pace from most of the epic fantasy landscape. Staveley seems to draw more inspiration from the world around us, rather than the world of centuries ago. But most of all, the book does what few authors seem to have done thus far: conclude their epic. While Staveley will be revisiting the world, this particular chapter has been told, and it’s a satisfying one: characters are redeemed, several die, and the world is forever changed by their actions. It’s not a twist ending or a surprise that comes out of right field, but it’s suitably epic, one that brings this epic to an end. I can’t wait to see what other chapters are lurking in the depths of Staveley’s world: they promise to be as exciting as this book.